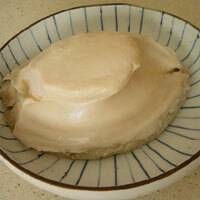 Occurrence: Abalone is normally eaten as a cooked dish. It may be found in soups or Chinese dishes such as dim sum. It is sometimes used in rice porridge but this is not common as it is one of the most expensive shellfish. Allergy to shellfish such as abalone which are molluscs is less well known than allergy to shrimps (crustaceans). As with most food allergies, symptoms are usually mild such as oral allergy syndrome but severe symptoms such as anaphylactic shock can also occur after consumption. Note that abalone is not currently listed in annex IIIa of the EU directive on labelling of foods and thus individuals allergic to molluscs must be alert to the possibility of abalone or other molluscs as hidden allergens. Allergy to abalone is most commonly associated with allergy to other related shellfish such as limpet, snails, winkles and whelks (gastropods). Reactions can also be triggered by eating more distantly related molluscs such as clams, mussels, oysters, and scallops (bivalves) or cuttlefish, octopus and squid (cephalopods). Thus after a diagnosis of allergy to one mollusc, patients are normally advised to avoid all molluscs. Whilst most individuals with allergy to shrimps (crustacea) can tolerate molluscs, individuals with allergy to both types of shellfish have been reported. However, individuals allergic to finfish (such as cod or salmon) do not generally have allergies to shellfish. Thong et al. (2005)  in a study of anaphylaxis in adults referred to a Singapore clinic found that ingestion of mollusks (abalone and limpet) was the most common cause of food related anaphylaxis with 11/30 cases. Lopata et al (1997)  divided the symptoms of 38 patients with allergy to seafood into four categories: cutaneous, gastrointestinal, respiratory, and others. Respiratory reactions were more frequent in subjects who also had other atopic diseases. Although most of the subjects (66%) reported symptoms within 2 hours of food ingestion, a significant number of subjects (13; 34%) only reacted between 2 and 7 hours after eating. In both groups the majority of the subjects (76% and 69%, respectively) experienced cutaneous and respiratory symptoms, whereas the remaining subjects were first seen with gastrointestinal symptoms. Zinn et al (1997)  described these patients together with additional fin fish and crustacea allergic patients. Reaction to abalone (also called perlemoen) was the third most common reaction to sea food after shrimps and crawfish with 38/105 patients reacting to abalone. Symptoms were not listed by food but it was noted that abalone caused several severe reactions. Maeda et al. (1991)  report 11 patients who developed moderate to severe anaphylactic reactions following ingestion of grand keyhole limpet (GKL) and abalone. Some of these patients may also have been amongst those described by Morikawa et al. (1990)  who reported 5 abalone allergic individuals. 2 of the individuals studied by Morikawa et al. (1990) only reacted 90 minutes to 3 hours after eating. Dohi et al (1991)  reported a single case of exercise induced anaphylaxis to abalone. One of the first cases of allergy to abalone was reported by Clarks (1979) . Wu & Williams (2004)  made abalone and limpet extracts by cold extraction of cooked shellfish in sterile PBS overnight. The extracts were centriguged at 50000 x g and the supernatants concentrated using Centricon YM-3 filter units (Millipore) to 20 mg/ml. Before use the extracts were sterile filtered and diluted 1:1 v/v with sterile glycerine. Lopata et al (1997)  made five in-house extracts (abalone, oyster, black mussel, white mussel, and squid) diluted in 50% glycerol (vol/vol) and used one commercial blue mussel (Mytilus edulis) extract (Soluprick, ALK Laboratories, Horsholm, Denmark). Extracts were made from the edible portions which were cut into small pieces and tumbled overnight at 4° C in phosphate-buffered saline (PBS). After centrifugation at 1000 x g for 15 minutes, the extracts were sterilized by sterile filtration (0.45 µm; Millipore), and the protein content was determined by using a dye-binding method (BCA-protein assay, Pierce) and stored in aliquots (100 µl) at –20° C.
Morikawa et al. (1990)  minced grand keyhole limpet, abalone, carp and baby abalone-like shellfish and made 10% extracts in water for 48 hours. After centrifugation at 1000 x g for 30 minutes, the extracts were filtrated, lyophilised and stored at 4° C. Keyhole limpet haemocyanin was from Sigma (St Louise, USA). Skin tests used 490 µg/ml, 1.6 mg/ml and 380 µg/ml for grand keyhole limpet, keyhole limpet haemocyanin and abalone diluted in 50% v:v glycerol. Lopata et al (1997)  read SPTs after 15 minutes. These were considered to be positive if the diameter of the wheal was at least 3 mm greater than that produced by the negative control, saline and glycerol. Histamine dihydrochloride (10 mg/ml) was used as a positive control. Morikawa et al. (1990)  read SPTs after 20 minutes. These were considered to be positive if the diameter of the wheal was at least 5 mm greater than that produced by the negative control of saline. Lopata et al (1997)  reported skin prick tests from 24 patients; 10 patients were excluded because they had reported very severe symptoms and 4 of the 38 seafood allergic patients identified were unable to attend. Maeda et al. (1991)  and Morikawa et al. (1990)  report skin prick tests on 11 and 5 patients respectively. Wu & Williams (2004)  aimed to use SPT to diagnose to which shell fish their patients were allergic. They reported that 70 patients gave positive SPTs to a shellfish and that 45 patients were sensitised (i.e. SPT positive) to abalone and/or limpet. 27 of these were also sensitised to crustacea. Limpet gave more positive SPTs (40%) than abalone (26%). Lopata et al (1997)  report 14/24 positive SPTs for abalone, 9/24 for oyster, 10/24 for black mussel, 6/24 for blue mussel, 5/24 for white mussel and 7/24 for squid. Maeda et al. (1991)  and Morikawa et al. (1990)  report positive SPT in their patients to either abalone or grand keyhole limpet. 4/5 patients of Morikawa et al. (1990) reacted to grand keyhole limpet (1 of these had reacted after eating abalone) and 1/5 to abalone (the abalone positive child had reacted after eating grand keyhole limpet). Only 1/3 reacted to haemocyanin. Food/Type of allergen:Lopata et al (1997)  used extracts made as for SPT including an extract from snail, Helix aspersa. IgE protocol:Lopata et al (1997) , Maeda et al. (1991)  and Morikawa et al. (1990)  used RAST. Maeda et al. (1991)  and Morikawa et al. (1990)  also used RAST inhibition. Lopata et al (1997)  tested sera from 38 patients who had reported symptoms with abalone and 10 fin fish sensitive controls. Maeda et al. (1991)  and Morikawa et al. (1990)  tested sera from 11 and 5 patients respectively. Lopata et al (1997)  reported that 45% of all sera tested (17 of 38) gave an elevated RAST value (as % binding of IgE to abalone). Of the patients with positive RAST responses to abalone, 8 of 17 also had elevated IgE to snail. Individuals with negative SPT responses had little or no IgE reactivity to the abalone by RAST. 6 of the patients who had negative responses to RAST tests, had positive responses to SPTs (probably reflecting limitations of the RAST analysis). Maeda et al. (1991)  reported a positive RAST for 11 patients. Morikawa et al. (1990)  reported positive RAST for 5 patients with grand keyhole limpet and abalone. Keyhole limpet hemocyanin and baby abalone-like extract was RAST positive with the 3 and 2 sera tested. RAST inhibition revealed cross antigenicity between grand keyhole limpet, abalone and keyhole limpet hemocyanin. Morikawa et al. (1990) reported that 1 sera was RAST positive for carp but that there was no RAST inhibition of the mollusc extracts with the carp extract. Immunoblotting separation:Lopata et al (1997)  separated proteins by SDS PAGE on 11% acrylamide 1D-separating gels by the method of Laemmli (1970) . Immunoblotting detection method:Lopata et al (1997)  electroblotted proteins onto polyvinylidene difluoride membrane (Hybond-PVDF, Amersham). Membranes were then cut into 5 mm strips, blocked for 30 minutes in 1% v/v blocking reagent (BM Chemiluminescence assay, Boehringer Mannheim), washed twice in PBS-Tween, and incubated overnight with 200 µl of serum sample in 3 ml of PBS. The strips were then washed twice with PBS-Tween for 10 minutes each and incubated for 2 hours with a mouse anti-human IgE antibody (diluted 1:3000 v/v in PBS). After washing twice, the strips were incubated for 30 minutes in biotinylated rabbit anti-mouse anti-serum (diluted 1:5000 v/v), washed, and finally incubated again in streptavidin-peroxidase (diluted 1:10,000 v/v) for another 30 minutes. After an overnight wash, the strips were developed by using a chemiluminescence detection system (Boehringer Mannheim) and exposed to Kodak x-ray film. Immunoblotting results:Lopata et al (1997)  reported that two IgE binding proteins with molecular weights of 49 and 38 kDa were consistently identified using sera from 5 of the 7 abalone allergic individuals tested. Higher molecular mass (50 - 70 kDa) allergens were also observed. IgE from the sera of abalone allergic patients also bound to proteins from snail, white mussel, black mussel, oyster, and squid. The main IgE binding protein from mussel had a molecular mass of 38 kDa and a protein from oyster at 38 kDa also bound IgE. High molecular mass allergens were also observed in snail and oyster extracts. Squid extract contained a 36 kDa protein which bound IgE strongly. Immunoblots with extracts from the abalone Haliotis rubra, with cooked H. midae or dried H. midae gave similar IgE binding patterns to those with extact of raw H. midae. Lee & Park (2004)  demonstrated strong IgE cross-reactivity between common whelk (Buccinum undatum) and abalone by ELISA inhibition. Wu & Williams (2004)  report a case of a patient known to be allergic to abalone who suffered fatal anaphylaxis after eating 3 snails. They also found significant cross-reactivity between abalone and limpet based on SPT results. However, the "limpet" species was not well defined. Lopata et al (1997)  show that the abalone species Haliotis midae and Haliotis rubra have similar allergens. They also show that IgE from abalone allergic individuals bound to proteins of other mollusks. Lu et al. (2004)  report a single monoclonal antibody against Japanese abalone (Haliotis discus) which distinguishes abalone from other mollusks. Lopata et al. (2002)  report a system of monoclonal antibodies capable of identifying the abalone species. Maeda S, Morikawa A, Kato M, Motegi Y, Shigeta M, Tokuyama K, Kuroume T, Naritomi Y, Suehiro K, Kusaba K, et al. [11 cases of anaphylaxis caused by grand keyhole limpet (abalone like shellfish)] Japanese. Common whelk (Buccinum undatum) allergy: identification of IgE-binding components and effects of heating and digestive enzymes. Lu Y, Oshima T, Ushio H, Shiomi K.
Preparation and characterization of monoclonal antibody against abalone allergen tropomyosin. Chu KH, Wong SH, Leung PS. Tropomyosin Is the Major Mollusk Allergen: Reverse Transcriptase Polymerase Chain Reaction, Expression and IgE Reactivity. Lopata AL, Luijx T, Fenemore B, Sweijd NA, Cook PA.
Development of a monoclonal antibody detection assay for species-specific identification of abalone. Thong BY, Cheng YK, Leong KP, Tang CY, Chng HH. Anaphylaxis in adults referred to a clinical immunology/allergy centre in Singapore. Zinn C, Lopata A, Visser M, Potter PC. The spectrum of allergy to South African bony fish (Teleosti). Evaluation by double-blind, placebo-controlled challenge. Immediate respiratory hypersensitivity to abalone. IgE binding on immunoblots survives cooking. Nature of main cross-reacting proteins:There are similar mass allergens in snail which bind IgE from abalone allergic patients. Other biochemical information:Lopata et al (1997)  identified the 49 kDa allergen from immunoblots using sera from 7 abalone allergic individuals but did not report additional molecular information. Alternatve Allergen Names:The tropomyosin from Haliotis diversicolor has been unofficially named Hal d 1. Sequence Known? :Sequence from Haliotis asinina, Haliotis diversicolor and Haliotis rufescens are available but only that from Haliotis diversicolor has been identified as an allergen. The allergenicity of tropomyosins can survive cooking, possibly because tropomyosin have a very simple helical structure which can rapidly refold after denaturation. Extracts from cooked abalone give similar immunoblots to extracts from raw abalone. More generally, Leung et al (1996)  demonstrated cross-reactivity between tropomyosins from arthropods (crustacea and insects), tropomyosins from gastropods: abalone (Haliotis diveriscolor) and whelk (Hemifusus ternatana), bivalves: mussel (Perna viridis), pen shell (Pinna atropupurea), scallop, oyster (Crassostrea gigas) and clam (Lutraria philipinarum) and cephalopods: cuttlefish (Sepia madokai), squid (Loligo edulis) and octopus ((Octopus luteus). Chu et al (2000)  also demonstrate IgE cross-reactivity by using recombinant tropomyosins from the abalone Haliotis diversicolor, the scallop Chlamys nobilis, and the mussel Perna viridis to inhibit IgE binding of shrimp allergic sera to shrimp extracts. Production of recombinant abalone, Haliotis diversicolor, tropomyosin as a fusion protein has been reported (Chu et al. 2000 ). The sequences of tropomyosins from abalone are rather similar to each other with sequences from Haliotis asinina Q7YZR4, Haliotis diversicolor Q9GZ71 and Haliotis rufescens Q25145 being 97-98% identical. A second sequence from Haliotis asinina Q7YZR3 is approximately 94% identical with these. The sequence from another gastropod, the snail Helix aspersa, O97192, is 86% identical. The bivalues show slightly lower levels of identity with oysters, scallops, mussels and clams having 70-80% sequence identity. Arthropod sequences are typically 57-63% identical and vertebrate sequences approximately 55% identical. Lu et al. (2004)  report a single monoclonal antibody against Japanese abalone (Haliotis discus) tropomyosin which distinguishes abalone from other mollusks.